"I've never loved anything the way that he loves music." Remember Wanda from In Living Color? She was hysterical with her cross eyes and red lipstick and crazy hair. I never thought I could ever see Jamie Foxx in any other role outside of that.Even when I saw him in a suit and bringing his A-game on the red carpet I thought Wanda was cross-dressing. But needless to say, after his Oscar-winning turn in Ray, I snapped right out of that. He was fantastic in the role, but I was interested to see what else he could do. Countless roles and CDs later, I still wasn't convinced of his range. But after seeing his newest movie The Soloist, I'm a finally aboard the Jamie train. In this new flick, in theaters April 24, Foxx plays a mentally ill homeless man in Los Angeles who's been blessed with the gift of music. 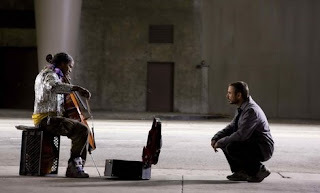 He meets journalist Steve Lopez played by Robert Downey, Jr. who befriends him and tries to help him find his way back to his first love--the cello. Meanwhile, upon getting to know more about Foxx's character and where he comes from and the true talent he possesses, Lopez's own faith in love is restored. Based on a true story, the book is the conclusion of several columns the journalist wrote about this man--from how he met him, to his talent, his family, and ultimately how the gifted artist revived his own heart. It's an amazing story. You know, most people see a homeless person on the street and try their best to avoid him at all costs. Though the journalist saw the story as a way to refresh his own byline, he got more out of it than that--he felt alive again. He finally finds something to fill the void in his own heart, by healing someone else's. Both performances are spectacular. I won't say anything more. Just go see it. I skipped to the end because I haven't seen the movie and dont want a spoiler. Oh my goodness, this is a movie that I have really been anticipating. So, I am really glad you've reviewed it here. i can't wait to see this. I've only looked at the rating and not the commentary. Want to see it first!